Hybrid table saws were invented for one single purpose – to offer similar features like the most advanced and professional cabinet saws, but for a more affordable price. They are the most popular among advanced hobbyists who don’t find contractor type powerful enough for their needs and don’t want to spend large amounts of money on cabinet table saws. So, if contractor saw doesn’t offer everything you need and cabinet saw is too expensive, hybrid saw just might be your best choice. Check out our ultimate list with reviews down below and find the right one for your workshop and needs. Who needs a Hybrid Table Saw? They are recommended for everyone who doesn’t find the contractor or portable type powerful enough for his needs and doesn’t want to spend large amounts of money on an expensive and professional cabinet saw. Compared to contractor type, they have enclosed cabinets with improved dust collection, more durable motors, and larger tables. They are also heavier, so they are not portable, but they provide much better stability. All of the products listed below are great buys, but most of it comes down to personal preference. We have gone through hundreds of customer reviews and testimonials, and we couldn’t find any cons about any of the best hybrid saws on the market listed below. We will try to update this list as often as possible. 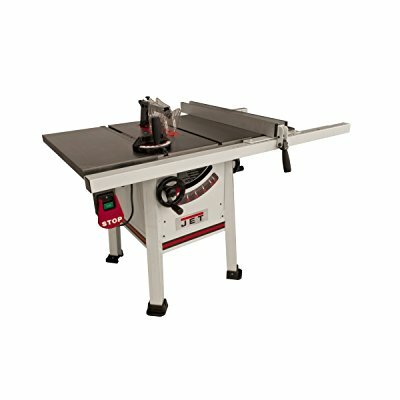 JPS-10TS is on top of our list It offers everything you could expect from a hybrid table saw, and it comes with free shipping option, so you can have one delivered right in front of your doorstep with no extra costs. It measures 82 x 35 x 39 inches and weighs 299 pounds, so it’s more compact than most cabinet saws. The motor produces 1.75 horsepower, so it’s powerful enough for all kinds of pressure-treated lumber. It runs very quietly and smoothly considering that it features a powerful motor. It comes with 5-year warranty, so you don’t have to worry about it breaking down any time soon. 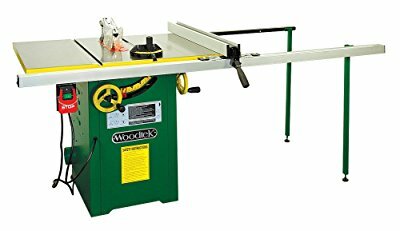 Woodtek 159665 is a 10″ hybrid table saw which offers an in-built tripod caster system and fully enclosed base for efficient dust control. It is slightly more expensive than some other products on our list, but that’s the price that comes with most top-end products. The motor produces 2 horsepower and runs on both 115 and 230 voltages. Customers highlighted its stability and easiness of use, and despite its large size, it only weighs 225 pounds, which is much less than some other products of this type. It features new riving knife design splitter with a practical see-through blade guard, so precision comes with ease. It offers maximum cut depth at 90 degrees at 3-1/4”. Shop Fox is one of the leading power tool manufacturers in the world, and their products usually receive high ratings and praises from many woodworkers and DIYers. W1824 is no exception and that’s why it managed to get on our list of recommendations. Single-phase motor produces 2 horsepower and can be used with both 110 and 220 voltage outlets. A polycarbonate blade guard is transparent, so the operator can see the blade cut at all times. This feature guarantees even better precision and easiness of use. 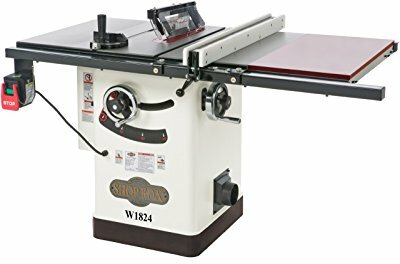 W1824 measures 58” x 36” x 40” and weighs 380 pounds, so it can provide the stability that can be found only on expensive cabinet saws. We will try to update this list as soon as possible and we will probably add more products on it in the near future, so stay in touch with the latest offers on our website! Do you have your own favorite? Give us your thoughts in the comments section down below.